Award winning eco artist & designer Sarah Turner hand makes beautiful lighting, sculptures, artworks and jewellery from waste materials. Discarded plastic bottles, cans, glass bottles & circuit boards are reincarnated into shiny new products. Whilst studying for her design degree in 2008, Sarah worked part time in a coffee shop. She noticed the massive amounts of plastic bottles & cans which were thrown away so decided to collect them & see what she could create. Now over 10 years later, Sarah's beautiful eco designs have been exhibited internationally at prestigious shows in London, Milan, Paris, LA, Baku & locally in Nottingham where she is based. 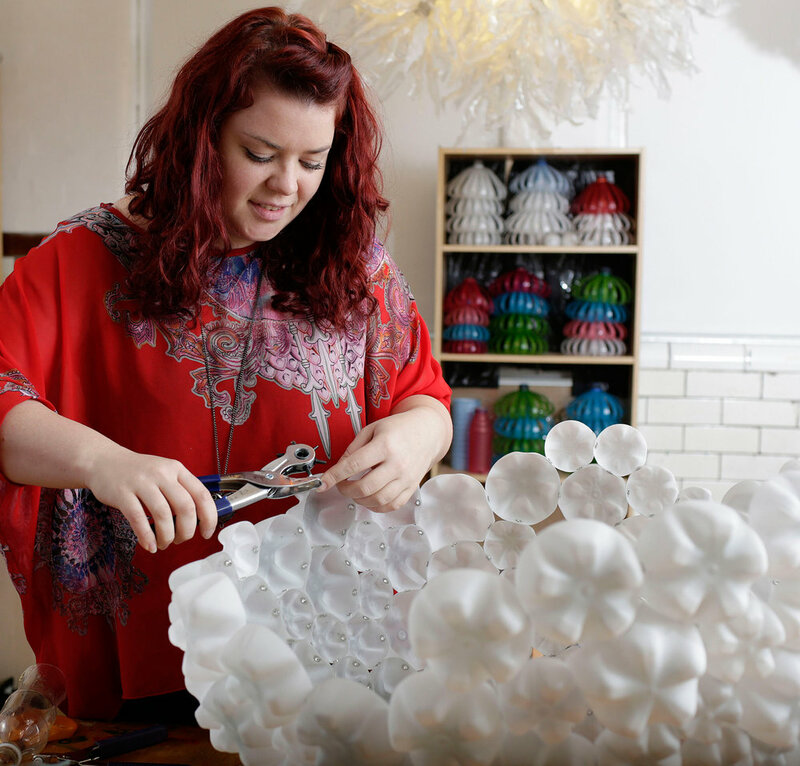 Sarah thrives on the challenge of creating something beautiful from waste materials. She analyses the natural properties & features of the waste material & takes advantage of them, using them in a new & creative way. With many of her designs the materials are so completely transformed you can't tell what they have been made from. Sarah’s work proves that.... "Just because a product is made from rubbish it doesn’t mean it needs to look like it does!" All of Sarah’s work is handmade in her studio in Nottingham from waste materials collected from local homes & businesses. We focus on upcycling common household waste materials which are causing the most environmental damage. We collect plastic bottles, drinks cans, glass bottles & electronic circuit boards as our raw materials. With some intricate making skills these discarded materials are handmade into high quality, unique designs.